So, you’ve got a question about ThreeWeeks. Feel free to email TWedinburgh@unlimitedmedia.co.uk, though the chances are your question may well already be answered somewhere on this page. 02 What is the Edinburgh Festival? 03 Where can I get ThreeWeeks? 05 How do you make money? 06 Can we use your content? 07 Can you explain your listings information? 08 How do I get you to review my show? 09 How do I get you to feature or preview my show? 10 How long after seeing a show do you publish a review? 11 How can I access reviews from past Festivals? 12 Do your reviewers follow a code of conduct? 13 I subscribed to the TW Daily email, but never receive it, why? 14 How can I review for ThreeWeeks? 15 How can I work for ThreeWeeks? 16 Why do you never answer my emails or return my calls? 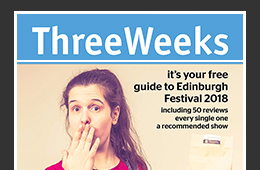 ThreeWeeks is the longest established specialist magazine at the Edinburgh Festival, the world’s biggest cultural event, and has been discovering and championing new and exciting comedy, cabaret, dance, musical, theatre and spoken word talent every summer since 1996. Each August half a million festival-goers rely on the ThreeWeeks free magazine, daily email, website and podcast for a comprehensive guide to all of the festivals that take place in Edinburgh during August, including the International, Book and Art festivals and the awe inspiring Edinburgh Fringe. The TW Magazine is available to pick up for free at sites all over Edinburgh during August, with pick-up points in bars, cafes and box offices at all the key festival venues. The Preview Edition, published in late July, is also delivered direct to the homes of over 20,000 Edinburgh residents. The ThreeWeeks editors have been covering the Edinburgh Festival for nearly two decades, and provide their expertise and continued passion for the world’s greatest cultural extravaganza each August, interviewing performers, directors and producers, commissioning guest columns, and reporting on key events in the Festival City. This experience is complemented each year by a vibrant review team who take in hundreds of shows first hand, sharing their opinions in ThreeWeeks, and helping us spot and champion the best new talent. The Edinburgh Festival is simply the biggest cultural festival on Planet Earth. Actually encompassing several different festivals that all take place in the Scottish capital during August – including the completely unprogrammed and simply awe-inspiring Fringe – the Edinburgh Festival boasts the most impressive programme of theatre, comedy, dance, opera, music, musicals, visual art, cabaret, and literary and political talks and debates that you will ever find in any one place at any one time. The Edinburgh Festival takes place in August, and more information on it is given here. There will be two editions of the TW Magazine in 2018 – the Preview Edition in late July and the Review Edition in mid-August. Find out where to pick up a copy here or read a digital version of the magazine here. The TW Daily email, published daily from late July to late August, provides all the latest news, interviews, columns and reviews in one place. To sign up for free click here. And you can check out all of our news, reviews, previews, interviews and columns here on the website, plus you can search content by genre, by venue or by year. CMU is owned by 3CM UnLimited, a media business based in Shoreditch, East London which operates independent publishing company UnLimited Media, education business UnLimited Learning and music and media consultancy UnLimited Insights. 3CM UnLimited is wholly owned by its two directors, Chris Cooke and Caro Moses, who also co-edit ThreeWeeks Edinburgh. Aha, a good question, well done. ThreeWeeks is wholly funded by advertising. The TW Magazine and TW Daily email are a proven way to reach Edinburgh Festival ticket buyers, whether they be Edinburgh locals, Fringe performers, or visitors from across Scotland, the UK and the world. 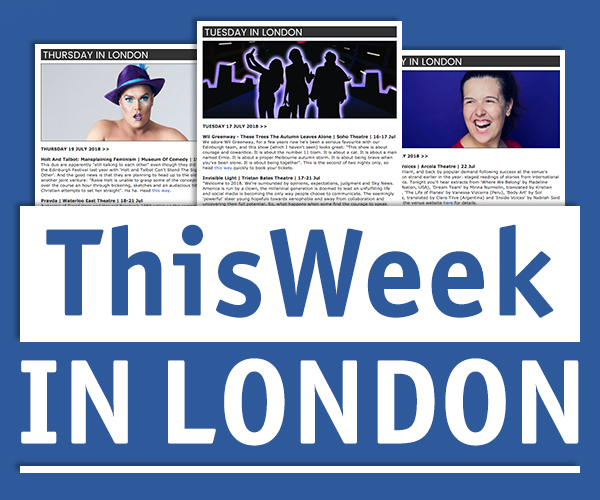 Advertising with ThreeWeeks offers producers, promoters and brands the opportunity to engage Festival audience members just as they are choosing which shows to see. Plus, as ThreeWeeks is run on a not-for-profit basis, every penny generated by advertising is reinvested into the project, enabling more and wider coverage and distribution. For information on how to advertise click here. If you want to carry our content email chris@unlimitedmedia.co.uk for more information. We provide only basic listing information for any show we review, preview or feature. For fuller listings you should check the relevant festival or venue’s programme, website or app. We do all we can to assure the listing information we provide is correct, though we recommend you double check with a venue or festival before making any firm plans. We will see and review hundreds of shows at this year’s Edinburgh Festival – but please note, with the Festival now being so big you are not guaranteed a review. To make sure you are on our radar you should click here and fill out this form. If we decide to review your show we will book tickets via your venue’s press or box office, so you should liaise with them for updates on if and when we have booked in. We start commissioning interviews from early June, but continue to commission well into the Festival too. We are looking to feature performers and shows that are quirky or different or interesting, and which we have reviewed positively this year or in the past. To be up for consideration for features simply make sure you have emailed your press pack to TWedinburgh@unlimitedmedia.co.uk. Once we have seen your show we will try to process the review as soon as possible, though it can take about seven days to go through the editorial system, and for various different reasons, sometimes longer. 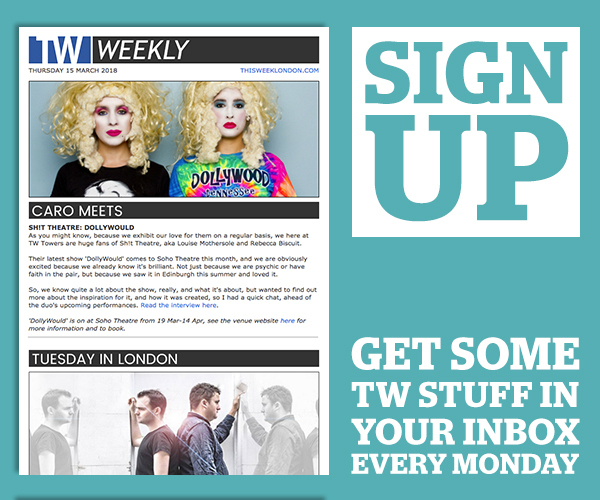 Not all reviews appear in the TW Magazine, but they all appear in the TW Daily email, so sign up to that! If a review is not published at all, it may be because our reviewer never actually managed to see the show even though a review ticket was booked (possibly because of a problem with the ticket order at the venue or for another logistical reason) or because the Editors decided it wasn’t appropriate to publish it (normally because the review was negative, but circumstances beyond the performers’ control mean the Editors believe it would be unfair to publish). 11 DO YOUR REVIEWERS FOLLOW A CODE OF CONDUCT? 1. Reviewers must only see shows in genres they have an existing passion for. 2. Reviewers must approach every show with an open mind and no preconceptions based on blurb, publicity or previous experience of a company or performer. 3. Reviewers must not allow the venue experience to affect their critique of a show – uncomfortable or chaotic venues are to be expected at the Fringe. 4. Reviewers are discouraged from dwelling on small technical errors, especially at early performances, as these will likely be ironed out once a show is properly up and running. 5. Reviewers must watch shows in their entirety, from beginning to end. 6. Reviewers are encouraged to read a show’s blurb before they see it, but only consult press releases etc for background information after the performance, so they see the show with only the information available to the public. 7. Reviewers are encouraged to take only minimal notes during the performance, so that they do not disturb performers or other audience members, and they fully experience the show as a member of the public would do. 8. Reviewers are encouraged to write up their reviews as soon as they have seen a show, while the performance is fresh in their minds. All reviews are submitted to the editorial team the morning after a show is seen. 9. Reviewers are not allowed to review shows they are involved in themselves, or where a genuine conflict of interest exists (eg a best friend is involved). All reviewers declare any conflicts of interest at the start of the Festival. 10. Reviewers are told to write their own personal opinions about the shows they see, and to not be influenced in any way by other media coverage of the same show. 11. When giving a negative review, reviewers are encouraged to clearly state what they felt had made the show weak. 12. Reviewers are told to ensure their write up matches the rating they award the show. 12 HOW CAN I ACCESS REVIEWS FROM PAST FESTIVALS? Unfortunately only reviews from the most recent Edinburgh Festivals (2011-2015) are currently online. We are looking into expanding our archives in the near future. 99 times out of 100 if you are not receiving our email updates it is because something on your company’s server is blocking it. This may be because there is some kind of block on emails coming from bulk mailing servers (we use the Constant Contact server). You should take this up with your company’s IT department. If you are using a home email account, it could be a junk mail filter that is stopping the updates getting through. If so, you will probably find the updates in your junk mail / spam folder. Either way, you should add ‘ebulletins@unlimitedmedia.co.uk’ to your ‘safe list’. If you need help doing this, or if that doesn’t work, then you should contact your internet service provider. If you are using a webmail service it is also likely to be a junk mail filter problem, and putting ebulletins@unlimitedmedia.co.uk on your ‘safe list’ may also help. Some webmail services block all emails coming from bulk mailing servers before they even reach your inbox or spam folder. Constant Contact generally has a good reputation for not allowing its server to be used for spam sending, and as a result emails sent via its servers, like the ThreeWeeks updates, don’t normally get blocked. That’s why we use its platform. But if you never get our updates, it might be worth contacting your webmail service provider and asking them if there is any filter blocking emails from ThreeWeeks, unlimitedmedia.co.uk or Constant Contact. If after all this, you are still having problems, by all means email TWedinburgh@unlimitedmedia.co.uk and we will double check you are on our mailing list, and look if there are any problems we can see at our end. For information on how to join the ThreeWeeks review team check the team page here. ThreeWeeks also takes on a number of paid staff members during August. These roles are usually advertised through the ThreeWeeks and CMU email bulletins. It’s normally performers and PR people who ask this question. ThreeWeeks is a small but very very busy operation – during August we’re a bigger operation, but 100 times busier! Unfortunately we simply don’t have the time to respond to every email or phone call that is chasing a review or following up a press release – if we did respond to every email and every phone call we’d not have the time to review as many shows. So – we’re sorry. But we do check every email sent to the TWedinburgh@unlimitedmedia.co.uk email and you can make sure your show is on our radar by filling out this form. ThreeWeeks was set up in 1996 by three then Edinburgh University students – Chris Cooke, Geraint Preston and Alex Thomson. Since 2001 it has been led by Chris Cooke and Caro Moses (who had reviewed and edited for the paper since 1996), and formally became part of Chris and Caro’s company, UnLimited Media, the following year. Over the years various editorial associates have donated their time for free to help the paper develop and operate, including Christabel Anderson, Alan Ogilvie, Sam Taylor, Chris Mounsey, Wystan Shaw and Tom Bragg.